We all know that the Beauty and the Beast Blu-Ray, DVD, and Digital Copy combo has made its way onto store shelves. I hope you snagged a copy for the kids! That was the first thing we did once they became available. 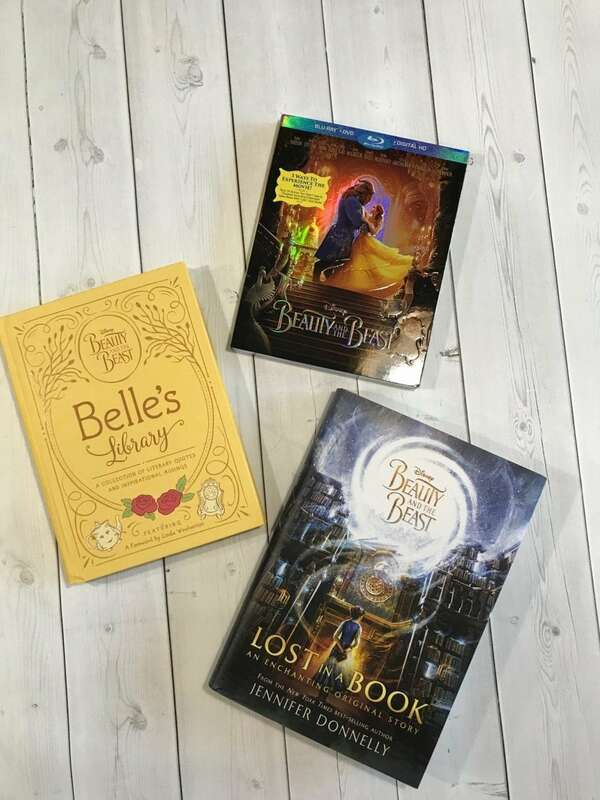 But did you know that there are some great book titles attached to the film to help extend your journey with Belle and the Beast? I just had to put these on your radar because fans can never get enough of this Disney classic and remake. Special Features include: 3 Ways To Experience The Movie: Play Movie, Play Movie With Overture, and Play Movie In Sing-Along Mode|Enchanted Table Read — You’re invited to join the cast for the movie’s elaborately staged table read, complete with singing and dancing to live music, set pieces and more!|A Beauty Of A Tale — Explore the process of transforming a beloved animated film into a new live-action classic|The Women Behind Beauty And The Beast — Emma Watson introduces several of the many talented women in all aspects of production who helped bring this enchanted tale to life|From Song To Screen: Making The Musical Sequences — Discover what goes into creating some of Beauty and the Beast’s best-known moments|Making A Moment With Celine Dion|”Beauty And The Beast” Music Video & Making The Music Video|Extended Song: “Days In The Sun” — Learn more about Beast’s childhood in an alternate version of this beautiful song|Deleted Scenes|Song Selection|And More! Disney’s Belle is one of the best fictional bookworms around. But what exactly is on her reading list? In this unique literary journal, enjoy inspiring quotes from some of Belle’s favorite books, as well as her insightful notes and colorful drawings. Includes a forward by noted Disney screenwriter Linda Woolverton. Some great extensions here! Grab them all while you still can. We all need to make sure our kids keep reading during the summer months. Give your daughters a tale as old as time. And if you want to read my review for Beauty and the Beast, be sure to click here.